-> Collection of beautiful hair and mustache / Beard styles. -> All hair / mustache / beard styles designed to fit to any face. -> Different styles Male, Female, Short, Medium, Long,hair cut, Beards and Mustaches. -> Cut the hairstyle by touching parts you don’t want. -> Allow to erase unwanted portion. -> Unique flip option to properly fit hair style into your face. -> 30 cool hair and mustache colors like blonde, brunette, red , brown , gray , blowout burgundy chocolate cherry , golden brown etc. -> Easy rotation and zoom . -> It let you share your beautiful hair style with your friends. Supports multiple social media sharing. 1.Select your photo from gallery or capture from camera. 2. Choose your hair / mustache / beard / sun glasses style. 3. Scale and rotate to fit hair / mustache / beard / goggles style to your face( both with slider bar and fingers). 4.Add color to hair and mustache / beard. Now you can add color to goggles also. 5. Add caps and tattoos to your photo . 6. Erase unwanted portion from your photo. 7. Flip left and right. 8. Apply effects to the final output. 9. Share your photo with Facebook, Instagram etc to your friend , family and hair stylist. 10. Save your creativity to gallery (Please try to check in albums folder to find your saved image). 11. Set image to wallpaper. Man Style Photo Editor is a collection of amazing hair styles, beard styles, moustache styles, cap, tattoo and many funny items. Man Style Photo Editor is a hair style app which let you change your hair style and moustache beard style together. Change your hair style and moustache in few seconds by using our man and boy hair moustache style changer application. Hair plays a very important role in a men's life. Moustache Give a royal and stylish look to men. For men and boys this app is the best face changer and make over application. Apply lot of image effects , moustache and beard styles and hair styles . Feeling bad because of less hair??? Use our Man Style Photo Editor make-up app and give a very smart and handsome look to your pic. Before going for hair cut , u can try these stylish hair style and moustache and a can select an appropriate and matching style for yourself. Try specially designed hairs and moustache styles maker very easily . Find modern, trendy hair styles for men and royal look mustaches . Make handsome and smart hair and mustache styles photo. Man Style Photo Editor will help you to give a dashing look. Add different types of hair and mustaches / beard style and check by urself , you could find a proper hair style which suits to your face. Try lot of hair colors to see which one suits to your face. Now no need to direct color your hair . First try hair and mustache colors using our app and select the right color in which you looks dashing and cool. Man Style Photo Editor make up kit lets you change your hair and mustache style together with very simple steps. Its very easy to use. You can also erase unwanted portions from your photo. Understand which hair style suits to your face shape. 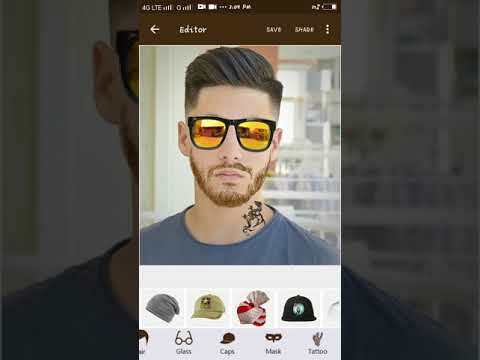 Add new hair style, beard style, mustache, goggle, cap, turban, tattoo in your photo and see how you look. 500+ style element to completely redefine your look. Easy to use Style Editor and share.